NETWORK FINALS: CASTAWAYS and the NBC Fall Preview promo special lost 0.1 in final numbers. CABLE HIGHLIGHTS: FX’s MAYANS MC fell 0.27 from last week’s huge premiere, but at 0.78 it was still the Tuesday cable leader. On USA, WWE SMACKDOWN lost 0.05 to 0.72, and THE PURGE was down 0.09 from last week’s premiere to 0.46. On Bravo, BELOW DECK slipped 0.02 to 0.45, and FLIPPING OUT returned at 0.28. On MTV, THE CHALLENGE shed 0.03 to 0.45. OWN’s THE HAVES AND HAVE NOTS gained 0.06 to 0.42. ESPN’s USA MEN’S SOCCER match was at 0.38. MSNBC’s RACHEL MADDOW SHOW topped cable news at 0.35/0.53/3.5M, with CNN’s CUOMO PRIME TIME at 0.27/0.39/1.3M, and Fox News’s TUCKER CARLSON TONIGHT at 0.25/0.44/2.8M. TBS’s WRECKED dipped 0.02 to 0.34. History’s 9/11: ESCAPE FROM THE TOWERS special was at 0.31. On TLC, OUTDAUGHTERED dropped 0.05 to 0.28, and RATTLED was down 0.02 to 0.15. On HGTV, DESERT FLIPPERS climbed 0.03 to 0.28, HOUSE HUNTERS ticked up to 0.26, and HOUSE HUNTERS INTL was steady at 0.24. Paramount’s INK MASTER gained 0.03 to 0.27. Food Network’s CHOPPED rose 0.04 to 0.25. On ID, THE DEVIL SPEAKS held at 0.25, and MURDER BY NUMBERS ticked down to 0.21. 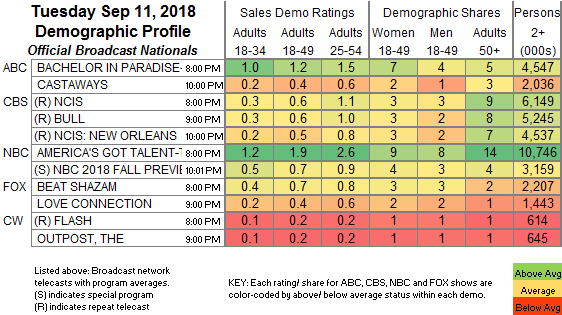 On Lifetime, MARRIED AT FIRST SIGHT lost 0.02 to 0.25, and SEVEN YEAR SWITCH was up 0.06 to 0.16. 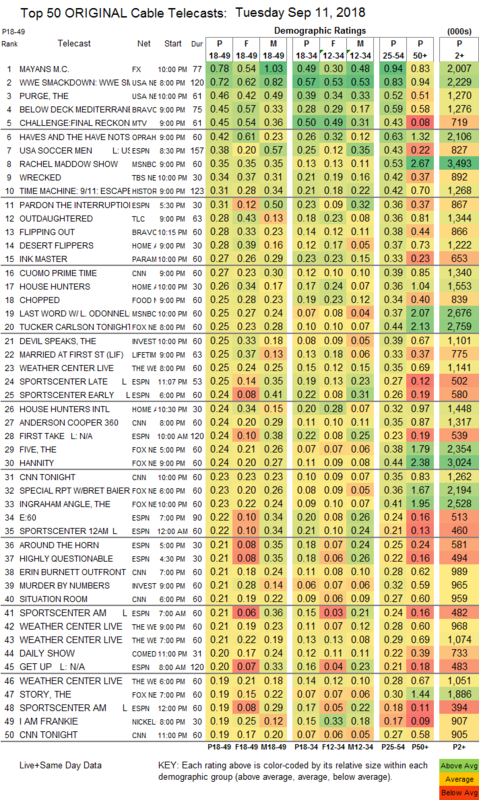 A&E’s THE FIRST 48 dropped 0.02 to 0.18. WGN’s CARTER ticked up to 0.05.